Samuel Bollendorff, born in 1974, was a member of the Œil Public agency from 1999 until its closure in 2010.He belongs to a generation of photographers who,during their formation,were trained to handle content as well as form. At the Louis Lumière school he mastered the technical side of photography.His art history studies gave him an eye for observation, while his stay at the Fine Arts School of Paris made him think about how to formulate his work. 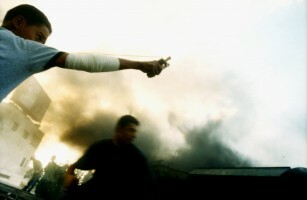 During the 90s, the press crisis forces freelance photojournalists to get together and form photographers’ collectives. In 2000, in order to safe guard the photographers’ means of production, Samuel Bollendorff organizes et becomes chair of the agency l’Œil Public, writing the founding charts guaranteeing the independence of this press agency managed by the photographers themselves. L’Œil Public, first collective to have successfully made the breakthrough to online content publishing, was an internationally appreciated agency, owing to the quality of its productions, the high standards of its investigations, but also for its capacity to create gripping stories in a time of crisis and despite highly unfavourable circumstances. It was one of the last independent French press photography agencies. 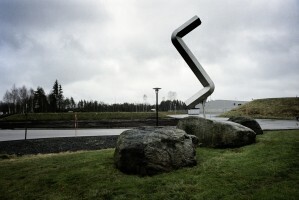 Beyond its independence, the originality of lʼŒil Public resided in the bringing together of ten independent photographers whose open approach, doubled by an interest for the burning issues of current events, brought a powerful and unique point of view on the world we live in. Their individual expression and aesthetic choices turned lʼŒil Public into THE agency of the new wave of documentary photography in Europe. In 2010, the photographers decide to close lʼŒil Public in order to lighten even further the economic model of the collective, to adapt to a changing world and go on defending their freedom of expression. 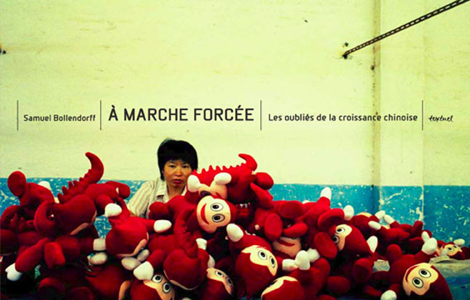 As a freelance press photographer, he started out collaborating for five years with the Libération newspaper. Hospital, school, police, prison, he proposed a socially-inflected viewpoint on French institutions. 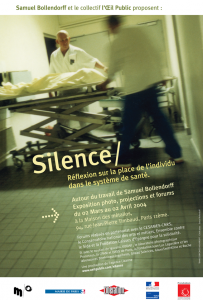 Maternity ward, Psychiatry, Emergencies, Geriatrics, from 1998 to 2004 Samuel Bollendorff’s work focused on the public hospital system in France, questioning the place of the individual in a clinical environment. His work was published in many periodicals such as LʼExpress, ELLE, Le Monde, Le Nouvel Observateur, and shown as a projection at the photography festival Visa pour lʼImage. 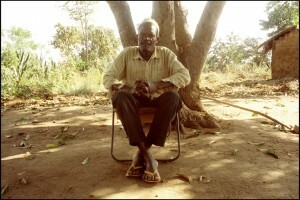 From 2000 to 2003, he realized a series of portraits on the social consequences of AIDS. Winner of the Fondation Hachette Special Prize 2002, and recipient of a honorable mention at the Kodak Critics’ Prize 2002, SILENCE AIDS will be projected at the Visa pour lʼImage photojournalism festival and shown as an exhibition by the Ministry of culture in Perpignan. In 2004, the book and exhibition SILENCE at the Maison des métallos in Paris, present the entirety of his work on the topic of health. SILENCE is the answer to an interrogation on photography’s power as a tool for political thought. At the heart of this event for which 150 000 euros of public and private funds were raised, a series of forums invite the public, the medical profession and elected representatives to debate the issues approached by the images. The event will bring together 5000 persons, during the month of March 2004. It is part of the Office’s for Health Prospective think tank, of the Health Chair of the Paris Institute of Political Studies, under the supervision of Didier Tabuteau. In 2005, he proposed to the Libération newspaper a chronicle on the Parisian suburbs. For one year he filmed, in collaboration with Jacky Durand, Libération journalist, a day to day account of life in the Grigny II and la Grande Borne housing projects, in the Paris area, published each week for six months in the paper edition of Libération, and on its website. This unfortunately foretelling work was concluded by the 2005 riots. Shown at Visa pour lʼImage in Perpignan, this series proposed for the first time in the history of the festival a mixed-media exhibition, containing still and moving images. Drawing from this word, he would create in 2006 his second film, “Cité dans le texte”, a 52 minute documentary produced by Zadig productions. From 2006 to 2008, he worked on a series on those that were forgotten by the Chinese economic miracle. 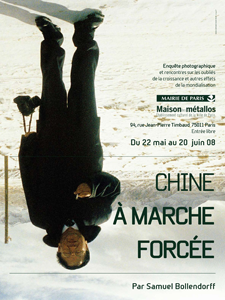 China – The Forced March www.oeilpublic.com was shown and nominated to the Visa dʼOr award at the Visa pour lʼimage festival in 2007, and afterward the series was acquired as part of the National Contemporary Art Fund. In Paris, the exhibition at the Maison des métallos in May and June 2008 attracted more than 6000 visitors. A public debate organized in partnership with Amnesty International discussed the issue of migrant workers in China nearing the opening of the Beijing Olympic Games. Read the text by Agnès de Gouvion Saint Cyr, General Inspector for Photography in the French Ministry of Culture. 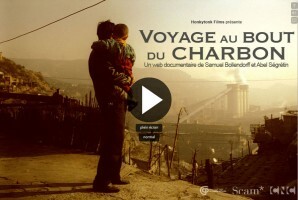 Late 2008, he completes Journey to the end of coal,( www.voyageauboutducharbon.com ) a first interactive web documentary published on lemonde.fr, the French newspaper’s website. 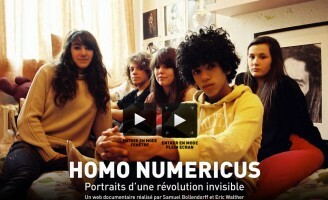 This new form of storytelling allows the web user to lead his own investigation, to make his own choices while surfing through a documentary made of photographs, videos, texts and sounds…Samuel Bollendorff is trying to capture thus the attention of the digital audience and reconnect them to the real world. In 2009, Samuel Bollendorff carries on his work on globalization. Taking the idea of the blurring of borders, a main tendency within globalization, as a starting point, these chronicles take to sketching the social and political portrait of this New World. Along areas that echo one another, they will try to approach issues such as the new social, economic or environmental balances, consequences of the emergence of developing countries on the international economic scene, but also the standardization of cultures now in the making. 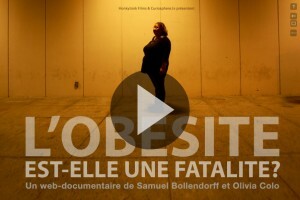 The Big Issue – Is Obesity a Fatality? From one edge of the modern world to another, are our ways of life and our habits of consumption trapped in a global spiral? Following the investigation, the web surfer will be drawn to question a society of plenty, in which marketing campaigns facilitate each day the dissemination of harmful substances that harm the bodies of those who are most economically vulnerable. It questions a globalization that does away with local customs, that standardizes different ways of life, that changes dietary habits. 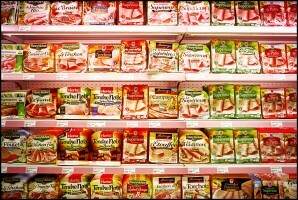 Have our world market and our urbanity severed our ties to the earth? Is obesity a symptom of the decline of a system? For the first time in 2008, the life expectancy of Americans has started to decline.